Nvidia MCP7a - better late than never! Nvidia will tell us that its latest integrated graphics chipset is on time but it's actually quite late. We're into October now and it was meant to be here sometime back in Q2. Back at the start of this year at CES, Tim was briefed about how all future Nvidia chipsets would include integrated graphics and how the entire Nvidia platform will be the one of choice for consumers. Despite our twitchy dislike of "platforms" and their possible limitations to consumer choice, I have to admit having read the Hybrid Power features it was actually a chipset I was genuinely planning an upgrade around and I'm still run an Intel P965 because of it. Cut to present day and you couldn't have predicted Nvidia's current market position and the year it has had. It's gone from a super Q4 in 2007 and having the chipset and multi-GPU platform of choice, to having serious competition from AMD, a questionable future in the chipset business and all manner of problems with the packaging of its products. Some of the problems it has admitted, and some are continually being discovered or insinuated. Oh yeah, and Hybrid Power hasn't made it into this product, which makes us question whether it'll be introduced in any future Nvidia chipsets for Intel processors. If it rings true, that'd put my upgrade on the back burner. There's a part of me that feels I might have my ears chewed off by Nvidia for saying that, even if it's justified. But I'll be OK though, as I've put my phone on silent and I'll pretend I'm on holiday. 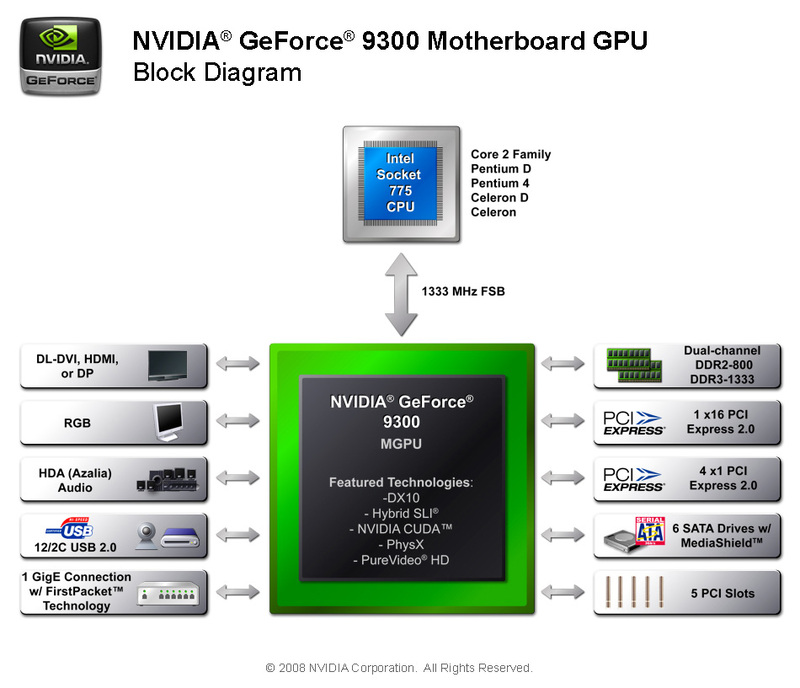 I expect some of you will be pretty miffed too - one of the major selling points for the GeForce 9-series was Hybrid Power, especially since Nvidia essentially rebranded the 8800 GT to the 9800 GT for arguably just this reason. Other models were die shrunk and Hybrid Power was added , but Nvidia documentation says that the feature is "only available in select designs," which makes it look like the company has given up developing it. What confuses us the most about Hybrid Power is that it's meant to be used with "juice guzzling" cards like the GeForce GTX 260s or 280s, however, these have an extremely low idle power - Nvidia quotes the idle power of these cards at 25W. Obviously products don't appear overnight so both must have been in development alongside each other, and considering Nvidia has been encouraging the platform initiative with ESA, nForce, GeForce etc for a while now - you'd think the two would be designed with each other in mind. Why do you need Hybrid Power if your cutting edge GPU uses only ~25W at idle? True, it does make for a significant 75W saving when three are used in three-way SLI and even 25W is still far more than any EPU, DrMOS or Dynamic Energy Saver technology will give us. However, without being on the more efficient Intel side of things there's not really any point. Nvidia has said to us that the reason it chose not to include the feature in this particular board is because the power savings "weren't that big" and how many of us would want to put a GeForce GTX 260 or 280 in our Home Theatre PC? What about the GeForce 9800 GT, though? That's a sub-£100 graphics card and it's fast enough to turn a Home Theatre PC into a reasonably capable gaming machine. The company told us that this particular card only consumes 30W of power at idle (it's based on the 55nm G92b) and so what we were told before applies again. Frankly, we think this is a bit of a short-sighted view to take - a 30W power saving is a 30W power saving at the end of the day and we'd love to lap it up.